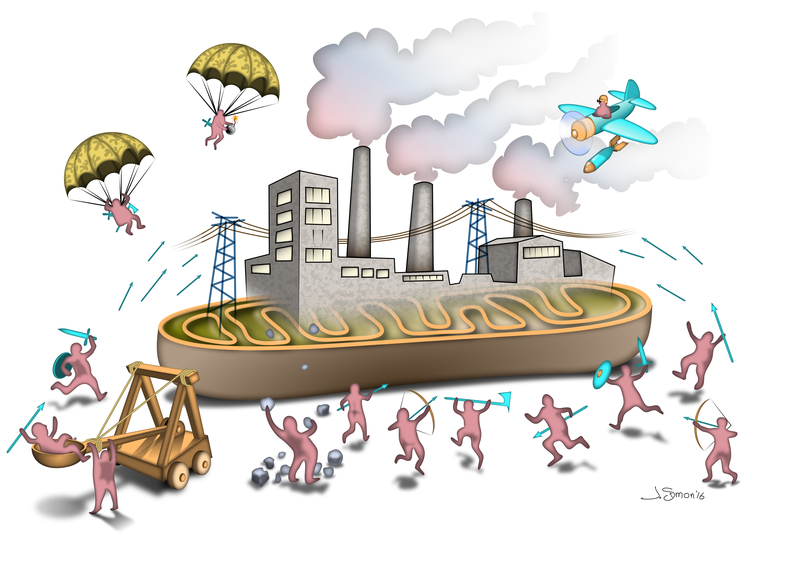 LA JOLLA—Mitochondria, the power generators in our cells, are essential for life. When they are under attack—from poisons, environmental stress or genetic mutations—cells wrench these power stations apart, strip out the damaged pieces and reassemble them into usable mitochondria. Salk scientists discover how mitochondria recover after damage, offering clues to cancer, diabetes and brain disease. 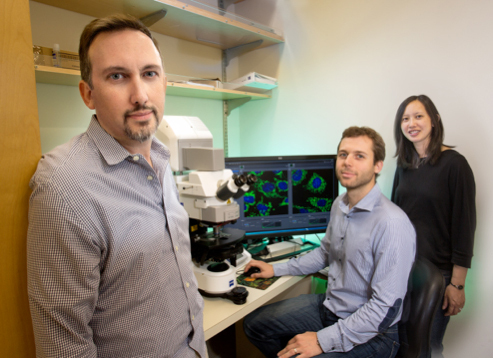 Scientists at the Salk Institute (from left: Reuben Shaw, Sebastien Herzig and Erin Toyama) have uncovered an unexpected way in which cells trigger a critical response to mitochondrial threats, offering insight into disorders such as mitochondrial disease, cancer, diabetes and neurodegenerative disease—particularly Parkinson’s disease, which is linked to dysfunctional mitochondria. Scientists at the Salk Institute demonstrated how a molecular sensor detects damage in mitochondria (green) and induces reorganization of the entire mitochondrial network (nuclei in blue). Normal mitochondria (left) undergo massive reorganization (right) after exposure to the toxin rotenone.